You'll be £25.00 closer to your next £10.00 credit when you purchase British Buses 1967. What's this? This book looks at an important turning point in the history of the bus industry in Britain. 1967 was the penultimate year to the end of an era, when private and semi-nationalized company's operated the bus networks in this country. After 1967 the network was never the same again, with the formation of the National Bus Company in 1968. The NBC was a very bland organization compared to the colourful bus companies that had existed before nationalization, and many small municipal fleets amalgamated to form Passenger Transport Executives. 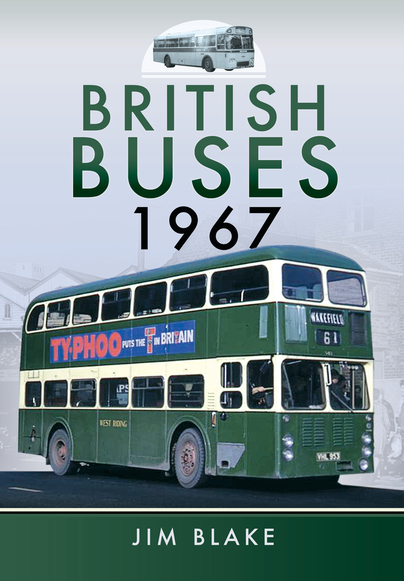 This comprehensive volume covers a large number of the bus companies throughout the country in 1967 and also has a good readable narrative describing Jim Blake's journeys travelling on these services across Britain. 180 black and white photographs and 50 in colour portray an interesting time. It is curious as a matter as mundane as the public transport service, the motor of a country, carries a great history full of sacrifices, disappointments and joys. Someone new to the subject may want to start with Part Three of this book, “A Brief Look at the Bus Enthusiast Movement” which also addresses questions of preservation and museums. Initially derided as cranks, the scribbled notes of the comings and goings of thousands of buses etc. (serial numbers, registration numbers, time and date, location, operator, livery and so forth) that such enthusiasts would amass on weekend jaunts all over the country to even the most obscure bus depots, garages, and terminals would, in time, become a critical resource to even the bus operators and government transportation agencies themselves. In 1967 alone, Blake shot some 4000 photos—or 100,000 from 1961 to 2014—and this book intends to show a cross section of the rolling stock in service. The three-part book consists mainly of heavily captioned photos, each part introduced with a detailed narrative. Non-UK readers may well have to get into the proper frame of mind first of all so as to better appreciate the post-war political and industrial developments and their effect on the rebuilding of a public transportation system. Blake casts a pretty wide net and the book really is accessible to anyone—even if it’s “only” for the photos because they invariably do show a whole lot more than just buses: fashions, landmarks, other cars, basically the whole atmosphere of life in Great Britain in 1967. The photo captions do call attention to such aspects, along with the specific features of the buses illustrated. Almost 50 years ago, transport enthusiast Jim Blake embarked on a trip around the country, taking numerous photos along the way. In British Buses 1967, you can see what the network looked like during this slice of social history. This book looks at the important turning point in the history of the bus industry in Britain, the year, 1967. The book is illustrated throughout with photographs, mostly black and white, but with a nice colour section, and is divided into three distinct sections. Part one provides an overview in which the author sets the scene as he remembers it. Part two, which makes up the greater part of the book, is a pictorial overview of the operators and vehicles that he saw in 1967, and part three takes a look at the preservation movement as it was at the time. The narrative is a very personal view of the bus scene in 1967, the captions are extensive and informative and the pictures are well composed and sharp. The author acknowledges the NTA website which he used to verify details of the various trolleybuses that appear in the book. All in all this is a well-produced volume that covers a period that many of us view with a great deal of nostalgia. The trolleybus coverage is sufficient to interest the student of UK trolleybus operations and the more general UK scene covered in this book is a bonus that should encourage many enthusiasts to add it to their collection. As featured in Buses magazine this extremely interesting book chronicles the transport scene during the swinging 60's, with a veritable cross section of many buses which the author found and photographed, most of which have never been published before. He showcases a great range of vehicles from extremely rare to perfectly ordinary, sure to evoke happy memories and funny recollections. A must real for all transport enthusiasts. Wether your a fully paid up bus enthusiast or simply have an interest in historic vehicles, Blake's photographs and commentary make this an essential purchase.